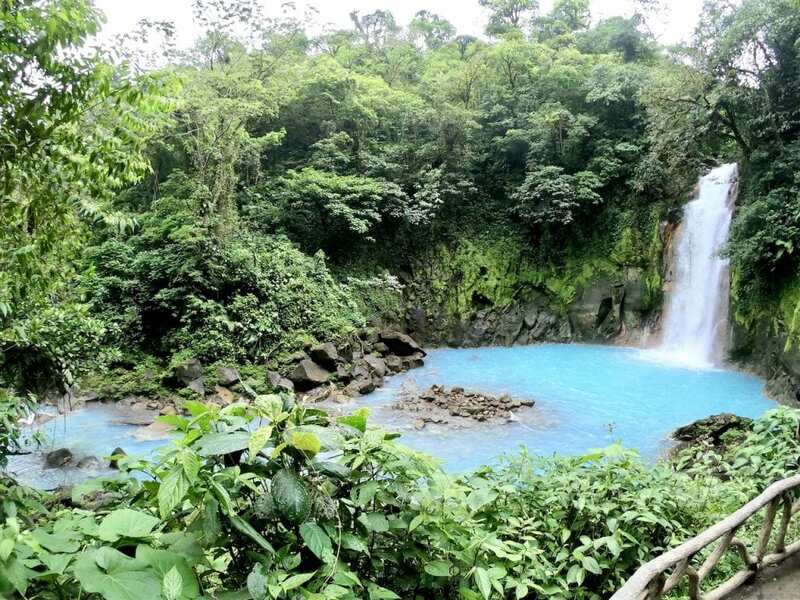 What comes to your mind when you hear Costa Rica? Sloths? Toucans? Macaws? 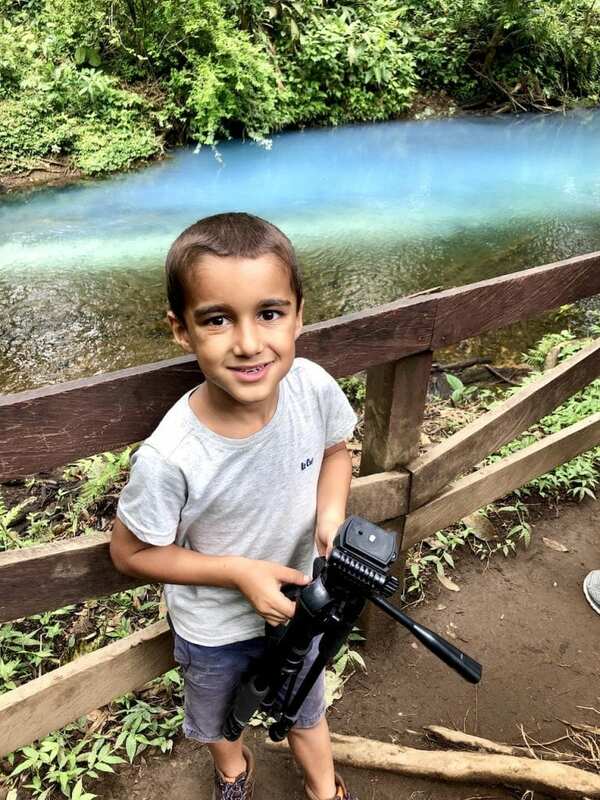 Maybe the rainforest, cloud forest, or volcanoes? Definitely zip lining! 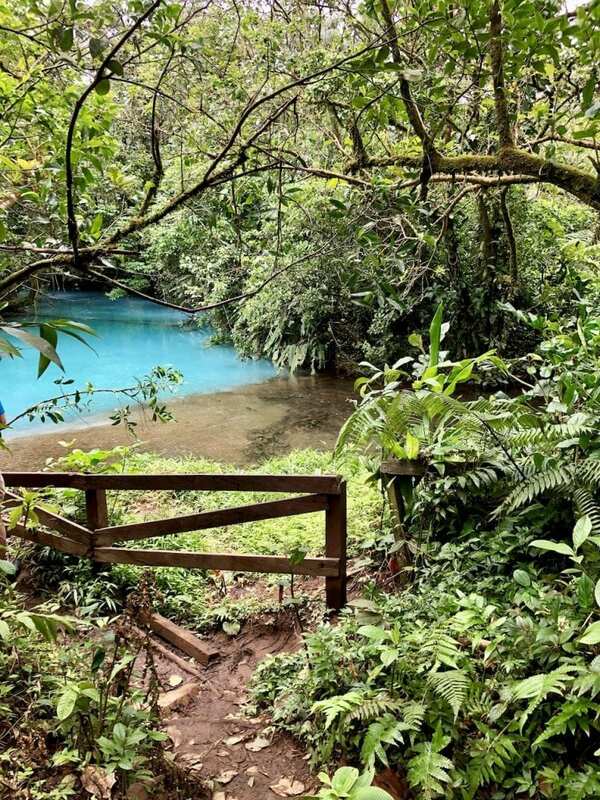 How about the Rio Celeste? 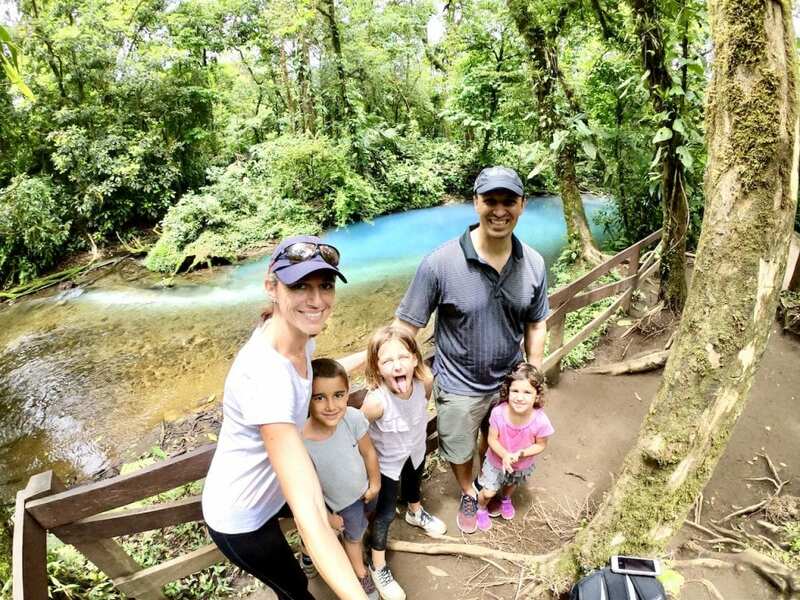 I had many expectations when I booked our family trip to Costa Rica, but I never expected the amazement we all felt inside Parque Nacional Volcan Tenorio! 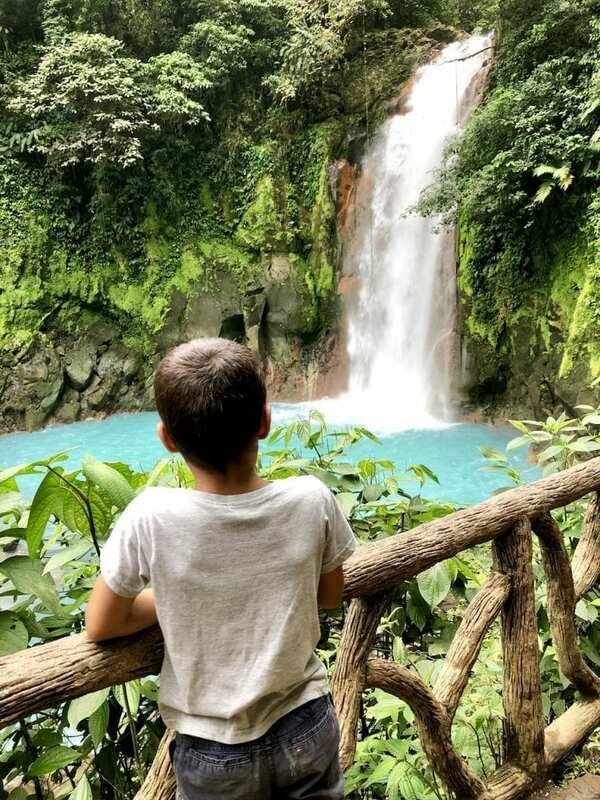 When we planned our itinerary, I was hoping we could fit in the Tenorio national park. So we added it to our schedule but I knew it could come off if it seemed like too much. 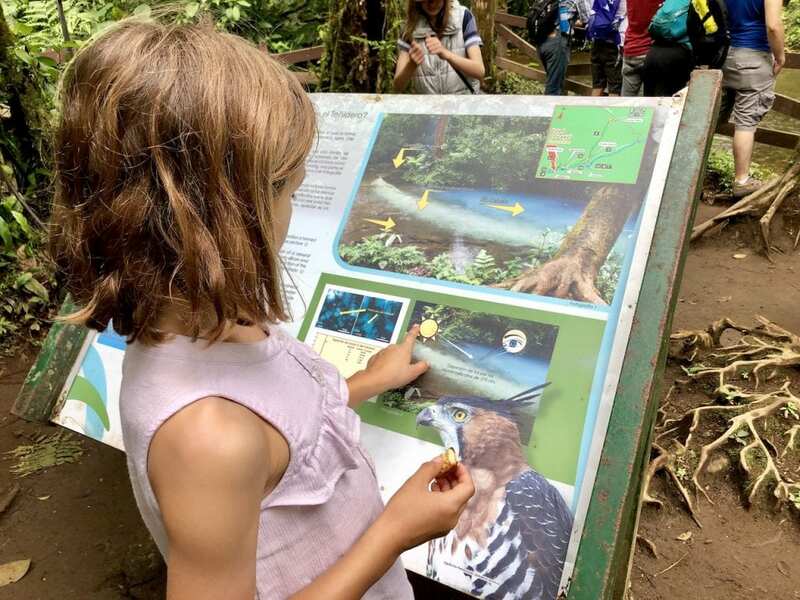 After a first day and a half near Volcano Arenal, we were excited to see something new, and already convinced that the Costa Rican nature was for us. 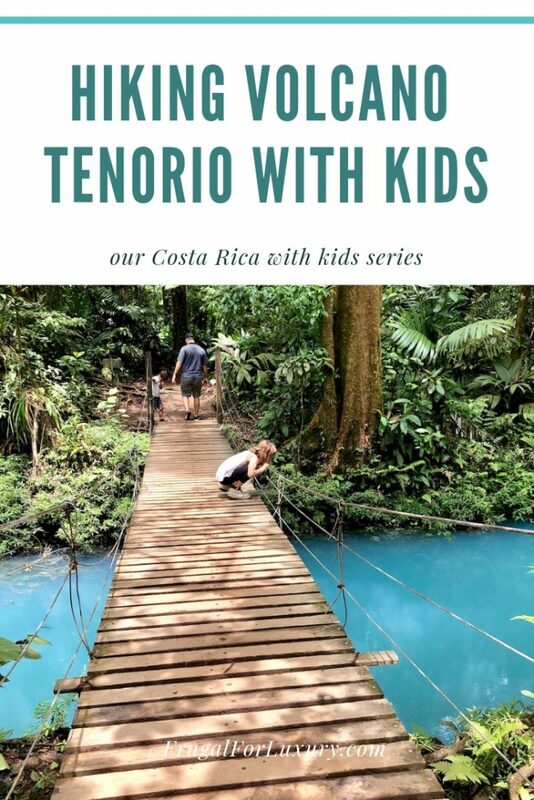 So we drove the 1.5-hour drive to Tenorio and made that an excursion on our way to Monteverde. 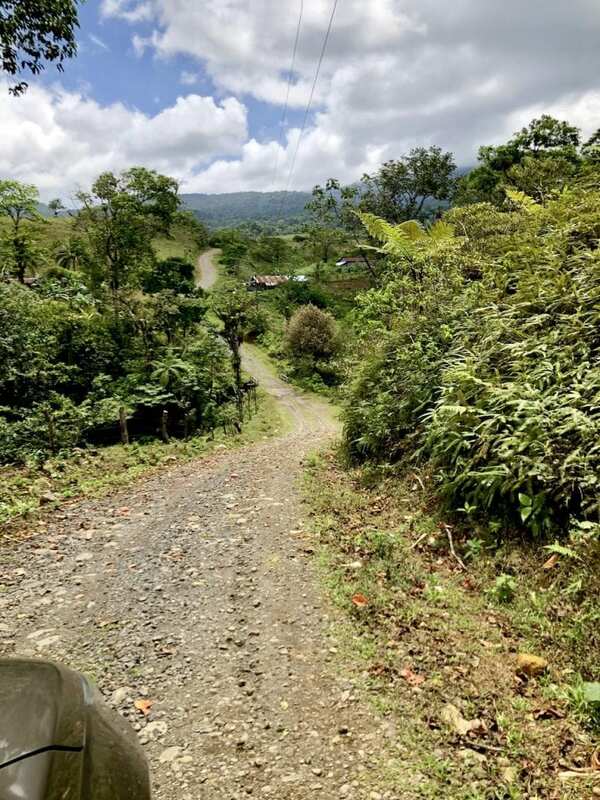 It was a fairly easy drive from La Fortuna, but once again, I do recommend driving a small SUV with 4-wheel drive! There is a pretty long stretch of uphill road until you get to the park entrance. Suddenly you pass the ridge and there’s a person wearing a safety jacket standing in the middle of the street, who pretty much forces you to make a turn onto a parking lot on the right handside of the road (opposite from the park’s entrance). OK, now… when it’s your turn to do this – ignore the lady in yellow, drive another 100 meters and park on the park’s parking lot, alongside the little restaurant, on the side of the park’s entrance. 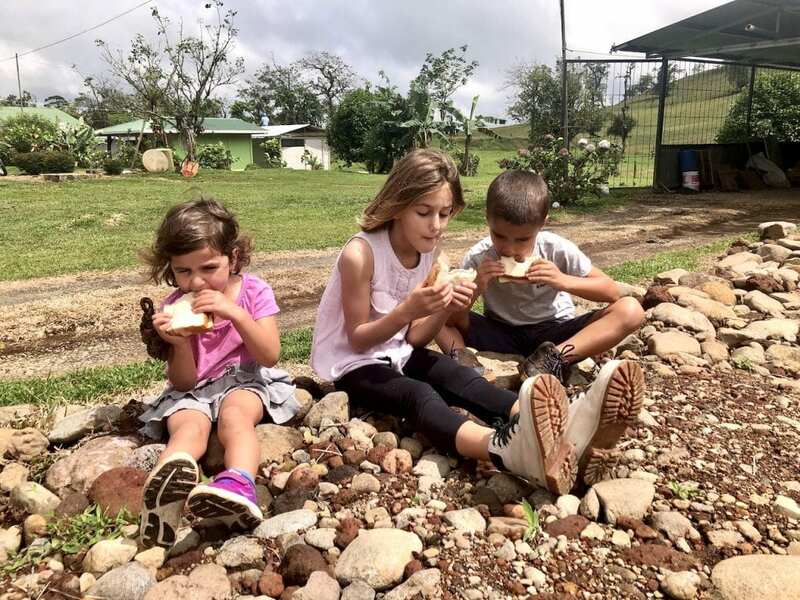 Hey, since we paid for parking, we had a pre-hike picnic right there!! 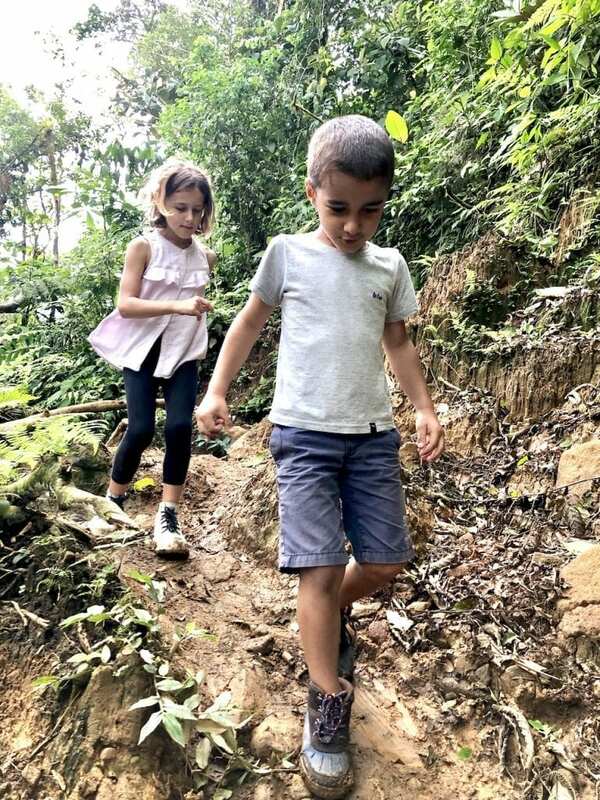 The “hike” inside the national park Volcano Tenorio is definitely accessible to kids. We took our time walking the entire thing, and were done in under 3 hours. There are times of uneven terrain, times of uphills and many stairs. 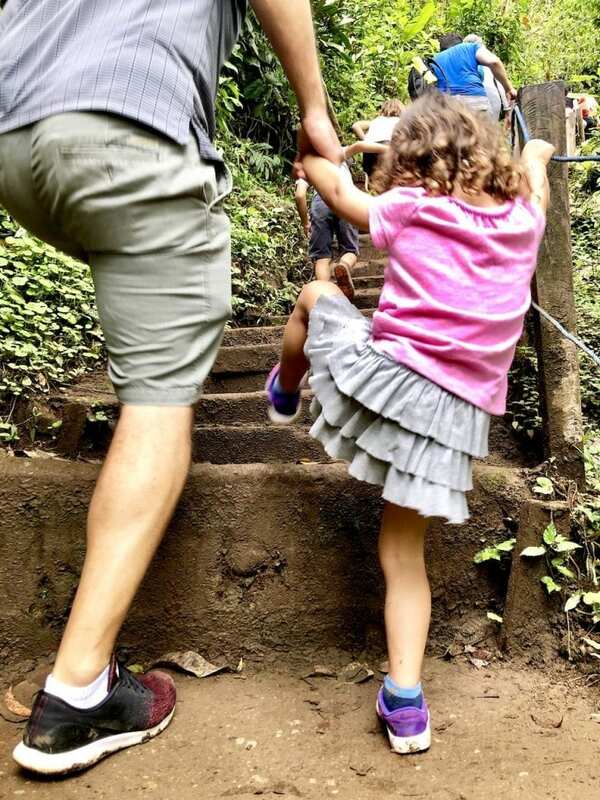 Some of the steps did feel like they were as high as Elin (3 years old). But there is also a part along the river, which is very flat and easy to walk for all ages. 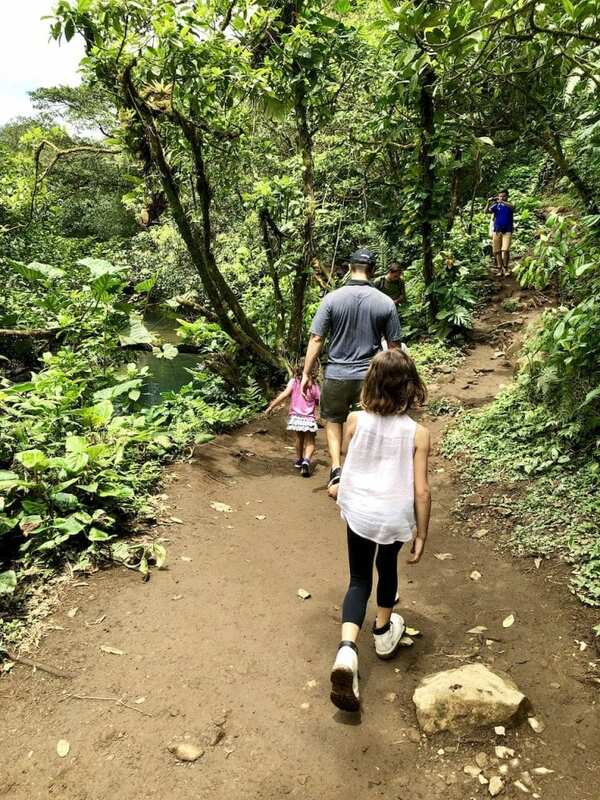 I would only recommend being comfortable with stairs if you want to hike down to the bottom of the waterfall. Additionally, I highly recommend traveling with a trekking baby carrier. Christian ended up with Elin on his shoulders for a portion of the hike, since she seemed pretty tired from the first two days of hiking we did in Arenal. 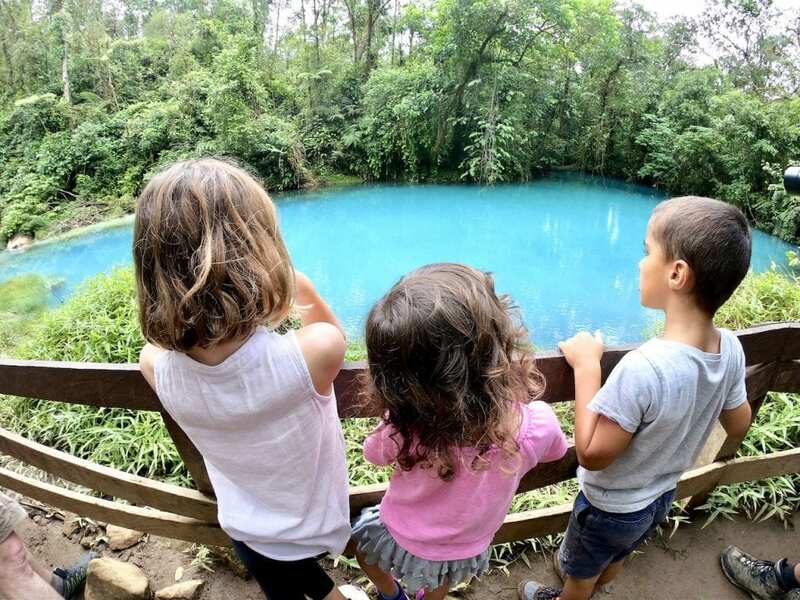 What makes this park super special and amazing is the color of the Rio Celeste. 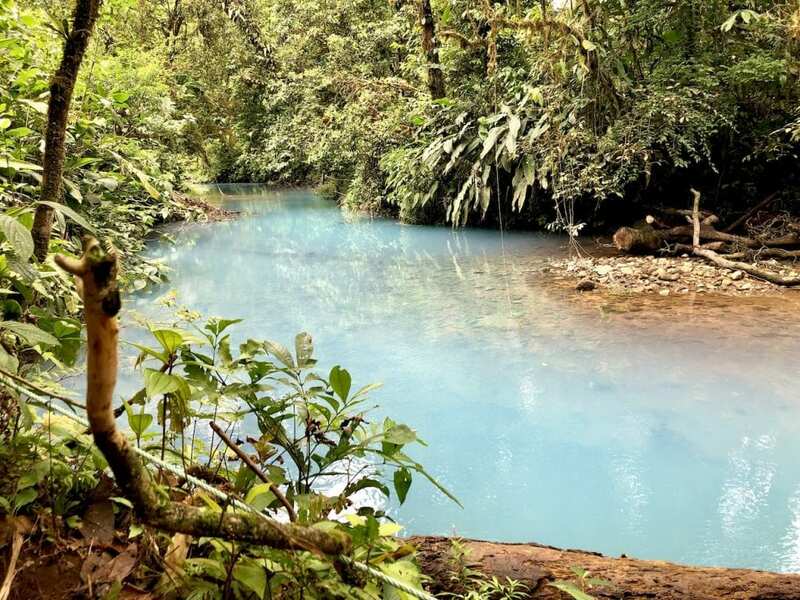 In short – the sediments in the water, coupled with the way the light reflects on it, give an insane blue color to the water. Something like you have never seen, especially inside a forest! 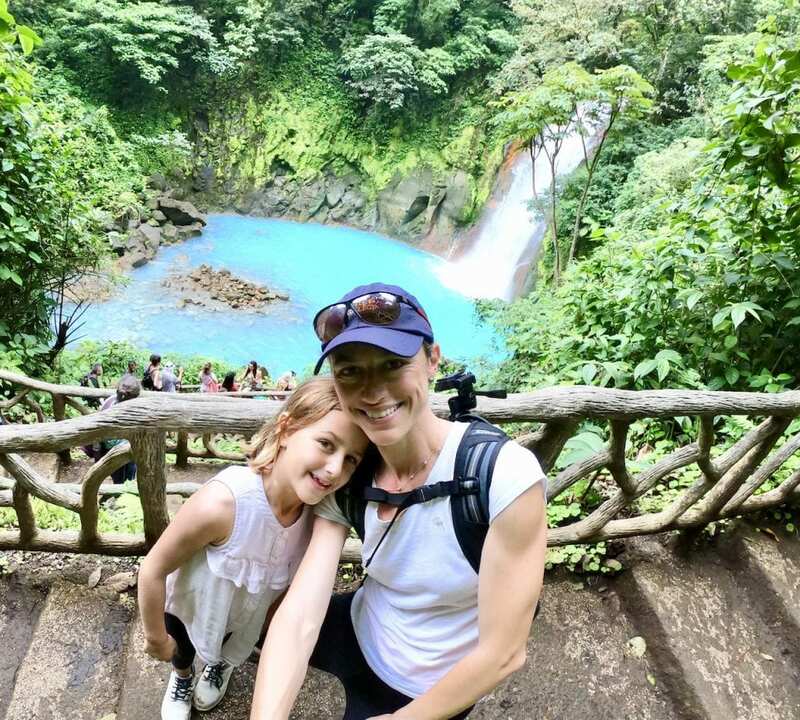 The very first stop on the hike is the waterfall! It is many stairs down, which you’ll need to hike right back up. But it is worth every bit of effort! 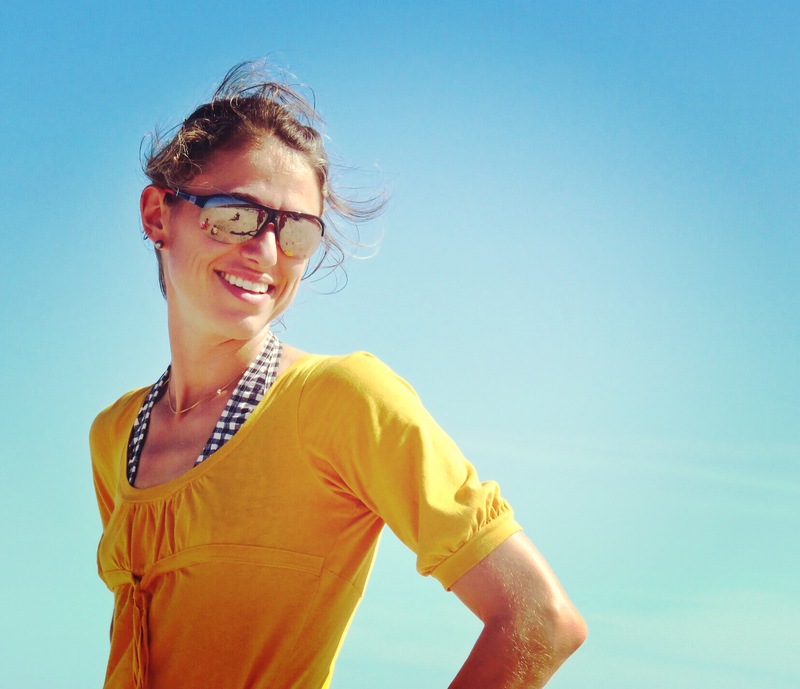 And for this view… I’ll hike a mountain! 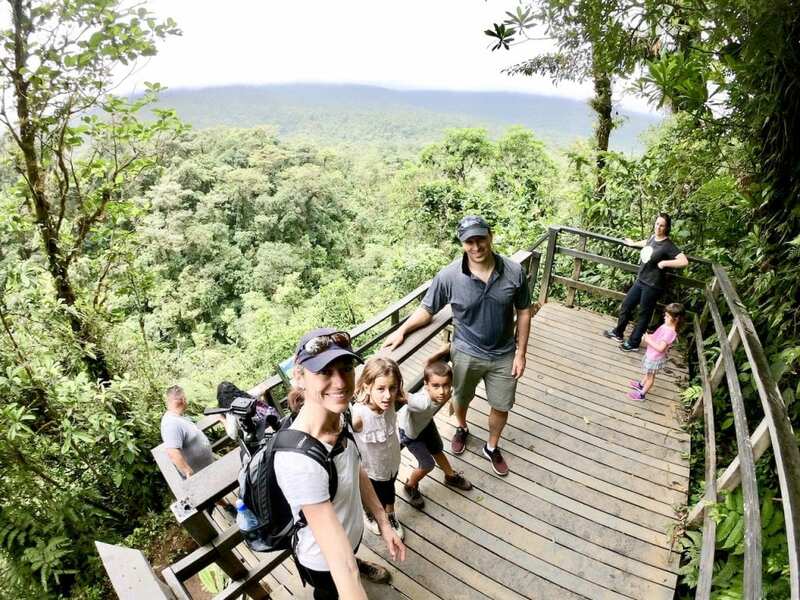 Parque Nacional Volcan Tenorio is also a smaller park, and maybe a bit out of the way, which has a major upside – less crowds!! 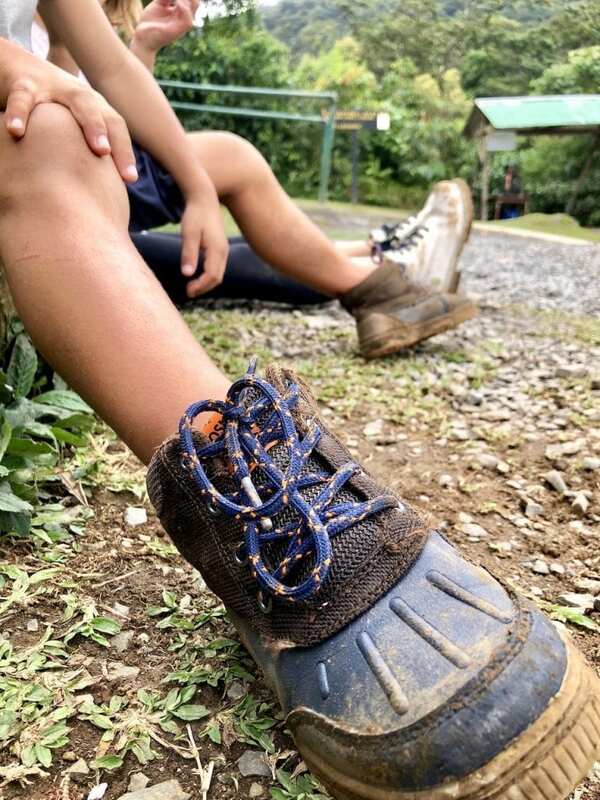 Once you are back on the trail, stop at the point of view on your way to the second stop. A double-decker platform gets you this incredible view!! A few steps down and around a curve, you find this little piece of paradise. 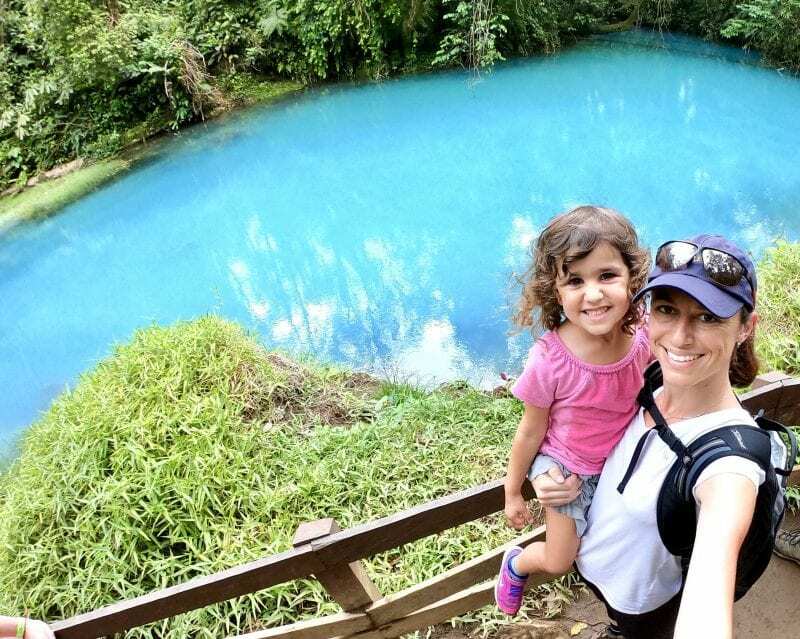 Take a minute to enjoy and reflect on the beauty of our planet! On our way out of the park, we met a family who wanted to turn back around after stop #2. I think we convinced them to keep going. 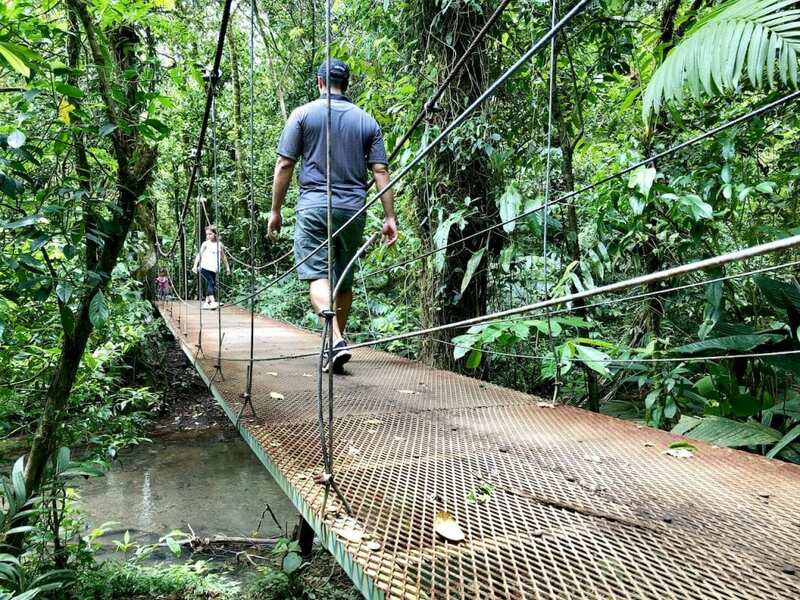 … but you’ll be walking on hanging bridges!!! 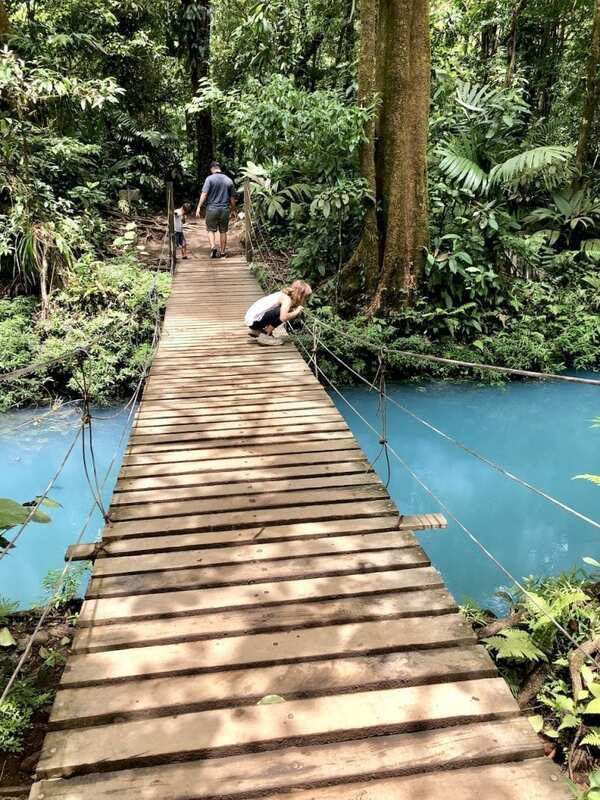 Which was my #1 wished-for experience in Costa Rica!!! You CANNOT turn back! The end of the hike is essentially flat and soooo beautiful! At the end of the hike is where the magic happen! 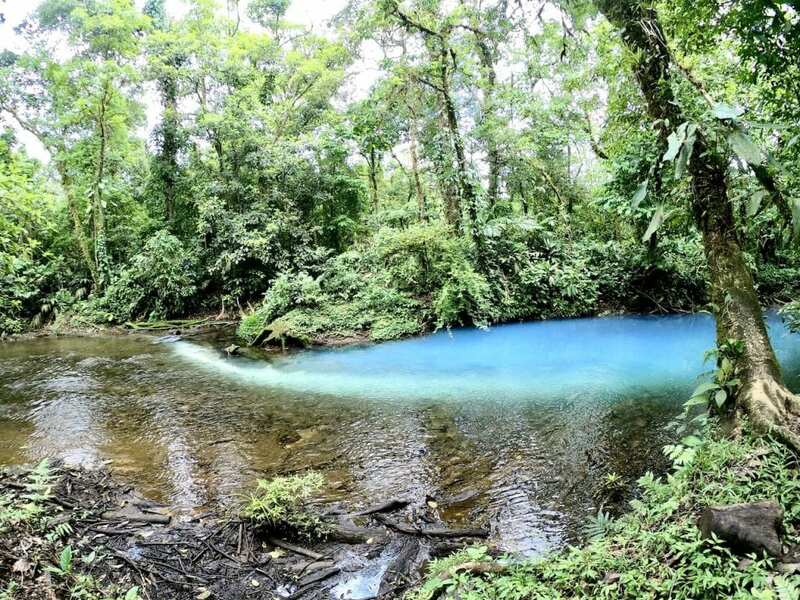 This is where the Rio Celeste changes color! Tell me you have seen anything more magical!! 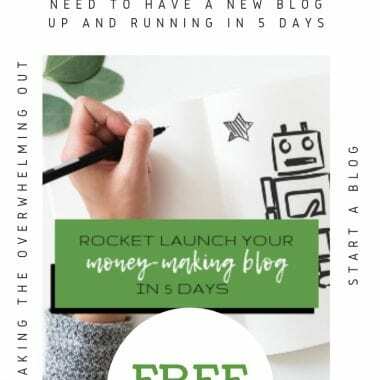 If you have, I need to know about it – please leave me a note in the comments box! 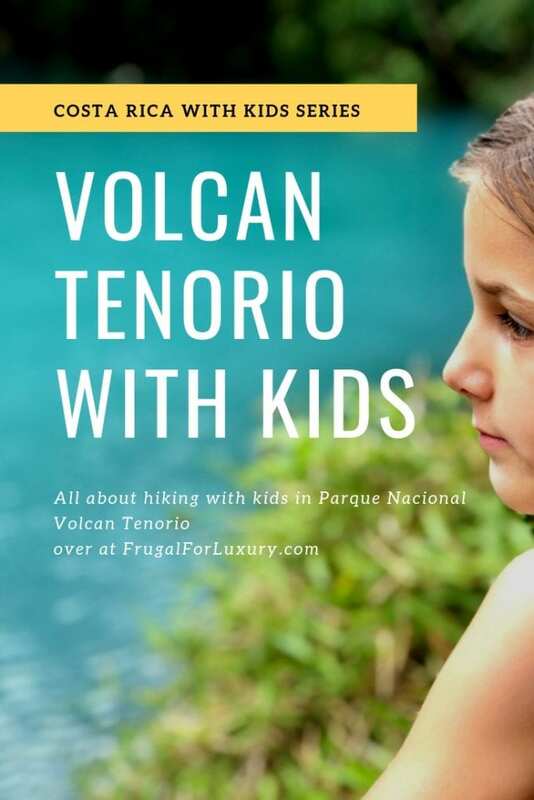 What I loved about Parque Nacional Volcan Tenorio is all of the learnings for the children. It was true world schooling. We all learned about the rain forest, sediments, sunlight reflection. 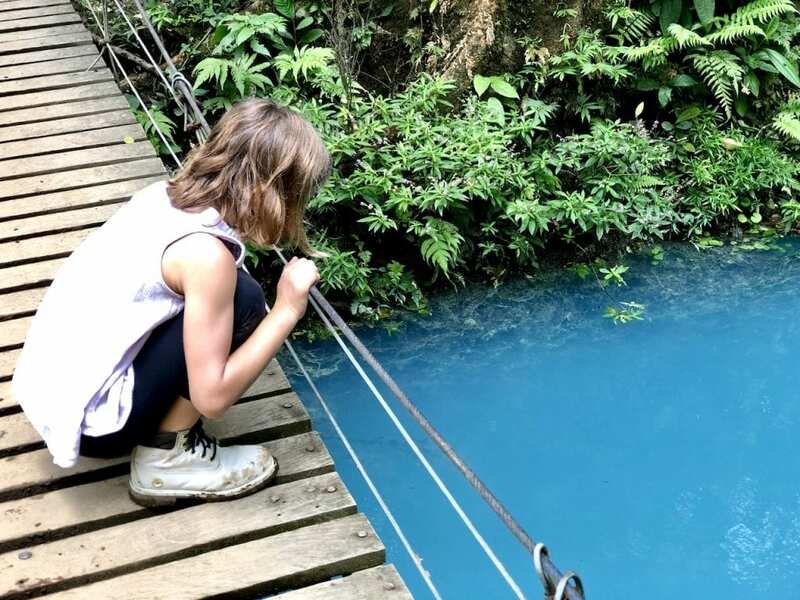 The kids hiked, crossed hanging bridges, saw flowers they’d never seen before. 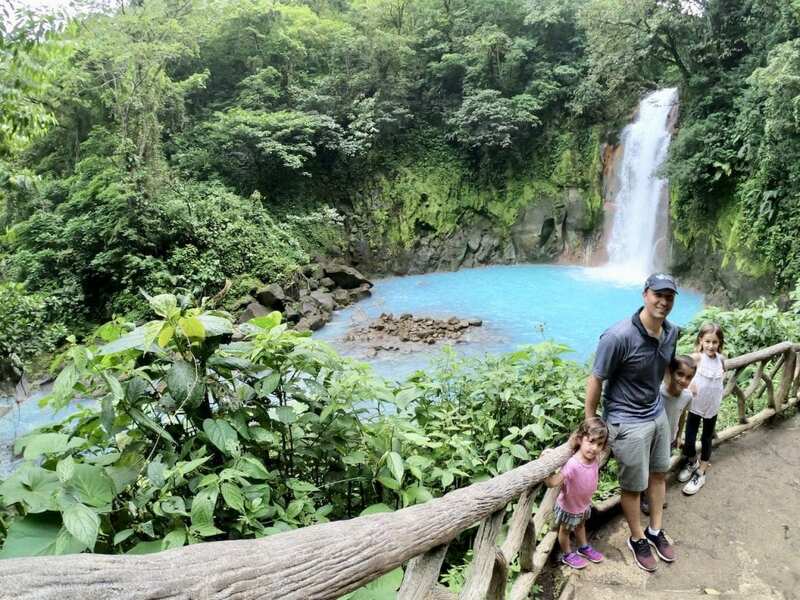 All of us had a tremendous amount of learnings and it is definitely a park you need to add to your itinerary if you are planning a family trip to Costa Rica!